Hite, Kenneth, Craig Neumeier, and Michael Schiffer. 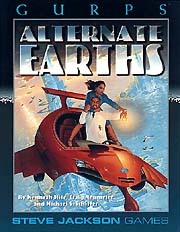 GURPS Alternate Earths . Steve Jackson Games 1996. Summary: Sourcebook containing six alternate history scenarios for the GURPS role-playing game: w88 android, "Ezcalli", "Gernsback", "Reich-5", "Roma Aeterna", and "Shikaku-mon". Published: Steve Jackson Games 1996 (1556343183BUY). Summary: Sourcebook containing six alternate history scenarios for the GURPS role-playing game: "Aeolus", "Caliph", "Centrum", "Cornwallis", "Midgard", and "Ming-3". Published: Steve Jackson Games 1999 (155634399XBUY). Summary: Sourcebook containing three alternate history scenarios and supporting material for the GURPS role-playing game: Craig Neumeier and Michael S. Schiffer's "The Terrible Ifs" and Hite's "Technomancer 1942", "World War 2.1", and "All This and World War, Too". Published: Steve Jackson Games 2003 (1556346611BUY). 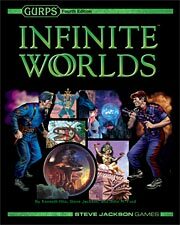 Hite, Kenneth, Steve Jackson, and John M. Ford GURPS Infinite Worlds . Steve Jackson Games 2005. Summary: Sourcebook for the GURPS role-playing game, including updated material previously published in GURPS Alternate Earths and GURPS Alternate Earths 2 , both q.v. Published: Steve Jackson Games 2005 (1556347340BUY). Hite, Kenneth, Craig Neumeier, and Michael Schiffer. "Dixie"
What if: William Walker kept control of Nicaragua in the 1850s. Summary: He would break the Union naval blockade and the South would have won the American Civil War. In the 1980s, the USA, CSA, and Imperial Germany are rival powers. Published: In GURPS Alternate Earths , q.v. Hite, Kenneth, Craig Neumeier, and Michael Schiffer. "Ezcalli"
What if: Carthaginians discovered America in 508 BCE. Summary: The early Columbian Exchange would have shattered the Roman Empire, and the Aztecs would eventually be the greatest world power during the early industrial era of the 1800s. Hite, Kenneth, Craig Neumeier, and Michael Schiffer. "Gernsback"
What if: Nikola Tesla married J.P. Morgan's daughter Anne in 1893. Summary: With Morgan's funding Tesla would have built many inventions, leading to a 1930s-style future run by the League of Nations and the World Science Council. Hite, Kenneth, Craig Neumeier, and Michael Schiffer. "Reich-5"
What if: FDR was assassinated in 1933. Summary: Germany wins World War II, the U.S. goes fascist, and the world goes to hell. Hite, Kenneth, Craig Neumeier, and Michael Schiffer. "Roma Aeterna"
What if: Drusus pacified Germany for Rome in 9 BCE. Summary: The Roman Empire would have developed a dynastic cycle like China, along with industrial-era technology, and control most of the world by the nineteenth century. Hite, Kenneth, Craig Neumeier, and Michael Schiffer. "Shikaku-mon"
What if: Ferdinand and Isabella's son John survived his 1497 accident. Summary: By 2000, the world's great powers would be France, Brazil, a Christian Japanese Empire ruling most of Asia, and a totalitarian Swedish Empire. What if: James II remained King of England after the Glorious Revolution failed. Summary: In 1943 Eastern Europe, a newborn Republican Alliance challenges the Habsburgs and the entire ancien regime. Published: In GURPS Alternate Earths II , q.v. Hite, Kenneth, Craig Neumeier, and Michael Schiffer. "Caliph"
What if: Haroun al-Rashid became the patron of a printing press in Baghdad. Summary: 800 years after a 9th Century scientific revolution, the interplanetary Dar al-Islam is cast into a terrifying war. Hite, Kenneth, Craig Neumeier, and Michael Schiffer. "Centrum"
What if: The White Ship carrying William the AEtheling made port safely. Summary: A dystopian crossworld-spanning culture built up after the self-destruction of a global Anglo-French Empire. Hite, Kenneth, Craig Neumeier, and Michael Schiffer. "Cornwallis"
What if: Turgot was not forced into retirement and quashed the idea of French aid to the American rebellion. Summary: In 1984 the "monarchic centralism" of the Five Thrones is threatened by the radical Russian Dominate. Hite, Kenneth, Craig Neumeier, and Michael Schiffer. "Midgard"
What if: Vikings burned Constantinople. Summary: In 1412 Norse-descended realms in northern Europe, Russia, and North America are starting a new age of expansion. Hite, Kenneth, Craig Neumeier, and Michael Schiffer. "Ming-3"
What if: A plague killed the Dowager Empress of China and causeed the Emperor to move the capital back to Nanking. Summary: Many fear the Ming have lost the Mandate of Heaven to rule the world-spanning empire they have constructed in the 450 years since Jeng Ho. Neumeier, Craig, and Michael S. Schiffer. "The Terrible Ifs"
Comments: Introduction to a role-playing game sourcebook which discusses alternate history in the context of World War II. Published: In Hite and Stoddard's GURPS Weird War II , q.v. Summary: Game scenario in which a magical event in Nuremberg in 1919 leads to the use of sorcery in World War II. Published: In GURPS Weird War II , q.v. What if: The Nazis adopted Hollerith computing technology. Summary: Role-playing game scenario in which the Wermacht uses advanced technology for operational analysis and crafting intelligent military strategies, and successfully invades England in 1941. Summary: Role-playing game scenario involving interdimensional combat in World War II after the "Philadelphia Experiment" tears a hole in space.